Carleton Place - Priorities at the Carleton Place and District Memorial Hospital. Together, we can make deliver the highest level of healthcare close to home. We are fortunate to live in a province and country where government funding finances the daily operation and administration of hospitals. However, it is our donors who take us to the next, advanced level of care through caring, quality and innovation; a level of care well beyond what might be achieved solely through government funding. Donor dollars provide specialized equipment and facilities, and support the continuing education and training of our staff, all of which serve to distinguish the Carleton Place and District Memorial Hospital (CPDMH) as a hospital patients recommend to their family and friends. Donor dollars do not fund the day-to-day operational costs of our Hospital, like administrative salaries and severances. 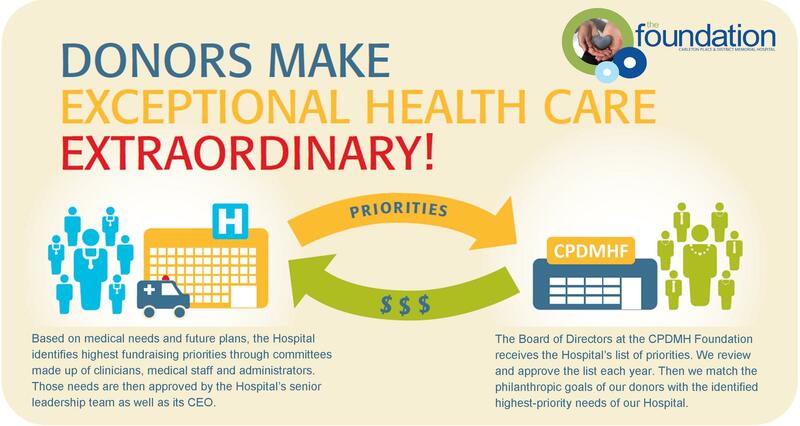 Donors to the CPDMH Foundation can support our Hospital and local health care by giving to a specific department or by supporting the highest-priority needs of the CPDMH Foundation. Either way, donations advance the standard of care and assist in the development of critical initiatives which would not otherwise be funded. Donations fund enhanced patient care, education and upgrades to the Hospital facility. Patient Care Equipment: Donations in support of patient care equipment fund projects that directly impact a patient's experience, including replacement equipment and state-of-the-art technology that gives Hospital staff access to the latest medical advancements to better care for patients. Education: Donations in support of education fund learning opportunities such as advanced training for health care professionals and educational programs for Hospital staff that they would not have otherwise have the opportunity to attend. Renovations and Upgrades: Although there are is no formal campaign for redevelopment at the present time, donors are able to designate funds and bequests to future renovations and upgrades to the Hospital facility.